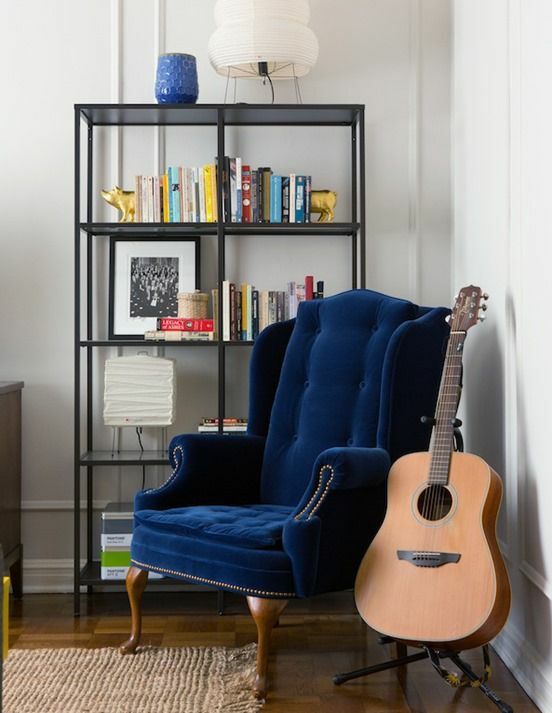 Wingback chairs are a favorite reupholstery project piece for many do it yourselfers. They have a classic, yet versatile design, and when they are reupholstered, they can take on a completely different look that can’t be found in a store. Although they often have curves and intricacies that can make adding new fabric difficult, wingback chair reupholstery is a project many first timers are able to handle. Getting your measurements right is a key part of the process of recovering a wingback chair. You’ll want to make sure you have enough fabric to fully cover the chair. This method requires you to measure each chair piece with the old fabric still on. While you have the option to keep the old fabric and simply cover over it with this method, it is recommended that you remove the fabric and start fresh once you’ve gotten your measurements. Step 1: Measure the seat cushion. Remove the chair’s seat cushion if possible, measuring the length, height, and thickness, then multiply by two as you’ll be adding fabric to both sides. Step 2: Measure the chair arms and depth. Start on the outside at the bottom of the chair, then measure over the arm into the seat. Then, measure the depth of the chair. Step 3: Measure the back. Measure the chair height from the lowest point to the highest. Then, measure the width at the widest part of the chair, most likely the wings. Step 4: Measure the back support. Measure from the top of the chair to the seat of the chair. Step 5: Add a few inches to each measurement. Adding a few inches will give you wiggle room when you’re cutting and upholstering. Step 6: Add all of your measurements. Add all of the measurements together for your total amount of fabric in inches. Divide the number by 36 to convert it to yards. Be sure to round up, as it’s always better to have too much fabric than not enough. Another option is to remove the old fabric pieces, then use them as a pattern for your new fabric. This method doesn’t really require any measuring at all, just tracing. However, it requires that you have new fabric ready to trace, which may be a problem if you’re not sure how much you need before measuring. Step 1: Remove the fabric. Using a seam ripper, gently remove the existing fabric from the chair. Be careful to keep each piece as intact as possible, as you’ll be using it as a pattern. Step 2: Lay the fabric out. Once you’ve removed all of the fabric pieces from your chair, lay down your new fabric. Then, lay each of the old fabric pieces on top of your new fabric. Step 3: Trace the pattern. Using chalk or pencil, trace the pattern of the old fabric onto the new fabric. Step 4: Cut the pattern out. Carefully cut out the new fabric pieces, leaving a few inches around the outside so you’ll have extra room to sew or staple if needed. In general, a wingback chair will need about seven and a half yards of fabric to be fully reupholstered. However, you should carefully compare your measurements to that of the fabric. Keep in mind that fabric may come in different widths, and that you may want to turn it one way or another to accomodate patterns.